Dumbbell flyes build strong pectorals. Some exercises provide loads of value to a workout. More often than not, they are simple exercises that become gym favorites. The dumbbell fly is a basic exercise that will shape and develop the muscles in your chest. Also, it provides benefits that make this a can't-miss chest exercise. Dumbbell flyes are an upper-body exercise that target the sternum attachment of the pectorals -- the muscles on your chest. The clavicle -- collarbone -- attachments of the pectorals, biceps and anterior deltoids, which are on the front of your shoulders, assist the movement as well. Dumbbell flyes are performed on a flat bench, starting with the dumbbells over the chest with the palms facing each other. With a smooth movement, separate your arms while keeping your elbows slightly bent. Bring the dumbbells out and to the side until they are almost even with your chest, then bring them back to the center. Dumbbell flyes provide a couple of excellent benefits. Joey Rodrigues, a supplement expert and personal trainer, says that dumbbell flyes are a tremendous shaping movement. Also, because dumbbell flyes are done with the arms pulling toward the center of the body, the exercise uses a basic pattern to train. The dumbbell fly doesn't require much equipment to perform. You can do dumbbell flyes while lying on the floor if you don't have a bench, and use canned foods for weights, if need be. And beyond just shaping the pectorals, the dumbbell fly will allow them to remain flexible. Rodrigues says that the dumbbell fly gives you a good stretch at the bottom of the movement. To get started with dumbbell flyes, do them on the days you would normally do your other pushing or chest exercises. 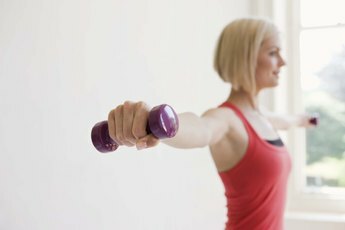 Start out by doing three or four sets of 10 repetitions, once or twice a week. After the first month is over, change your sets and reps to four sets of eight repetitions and add a little bit of weight if you need a challenge. When doing dumbbell flyes, lift enough weight to feel a burn when you have about three to four repetitions left in your set. Consult your doctor before beginning any new exercise program. Drink water before and during the workout to prevent dehydration. When you are doing the flyes, avoid straightening your elbows, because this puts too much pressure on the joint. Dumbbell flyes should cause a stretch, not pain, when you have fully separated your arms. If your shoulders hurt while doing this exercise, try not to lower the weights as far and use less weight. 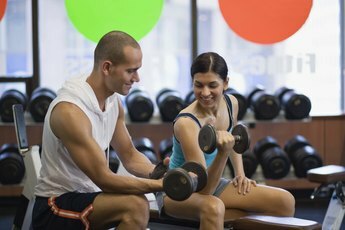 Work out with a personal trainer for a customized plan that will prevent injury.